New release! New registration field and bulk client notifications options. This week in our release we’ve added a new client registration field – file upload and new options for notifying your clients in bulk. In HostBill you can easily define information that is required upon client signup and stored in client profile through various Registration fields. Now, we’ve added a new field that enables your client to upload files during registration or profile edits. This field is especially useful if you need your client to provide for example proof of identity (a scan of ID etc). One registration field allows to upload one file. When defining the field you can set which file extensions are accepted (.png, .jpg, .pdf, .zip etc). Once the file is uploaded, it will be accessible in client files section in client profile. 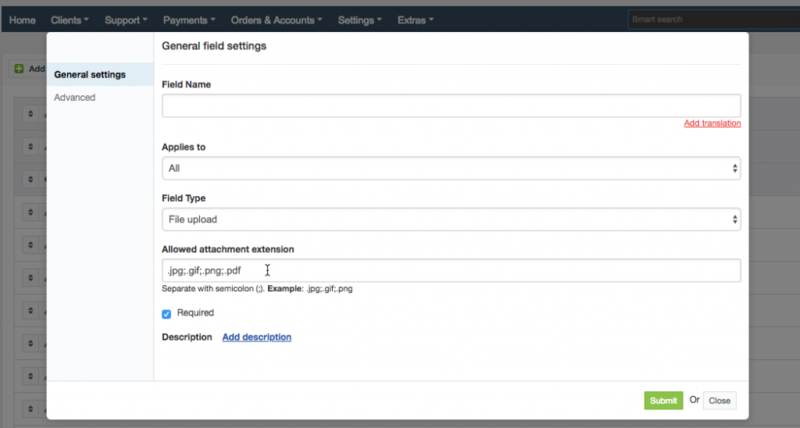 Admins can edit and delete files, you can also allow clients to edit the files after sign-up (upload a new file). Clients can’t delete uploaded files. Recently we’ve introduced client area notifications and now we’ve added a couple of new options for bulk notifications. First of all, you can now notify customers via automated portal notification for custom email message sent using bulk notify tool. HostBill comes with a handy option available in your Client list: send mass email. With this feature you can select group of customers and send them email. Once you select the customers, hitting the “Send” button will redirect you to “Notify Clients” section, where you will be able to compose a new message (or use one of the templates) and send the notification via email and via client area. You can also use variables in bulk messages sent to customers. Below the message ‘body’ you can simply tick the checkbox ‘use variables’, which will display the list of available variables. From now on you can also send mobile notifications to multiple customers at once using custom message or predefined notification template. Mobile notification feature is available in HostBill Admin -> Clients -> Notify clients. You need to remember to first enable mobile notifications and activate one of our mobile notifications modules, otherwise this option will not be visible. 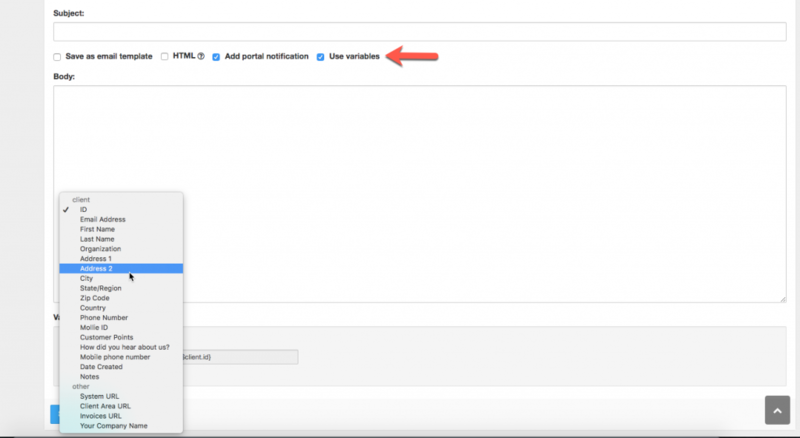 If you have multiple mobile notifications modules enabled, you can choose which method to use for a particular notification. While sending bulk mobile notification you can also use variables. It’s now easy to select customers to mass notify (either via email, portal or mobile) using customer selector. You can search for customers using country, services or related app criteria and HostBill will automatically fetch matching client data. Introducing new HostBill 2019 Licenses!